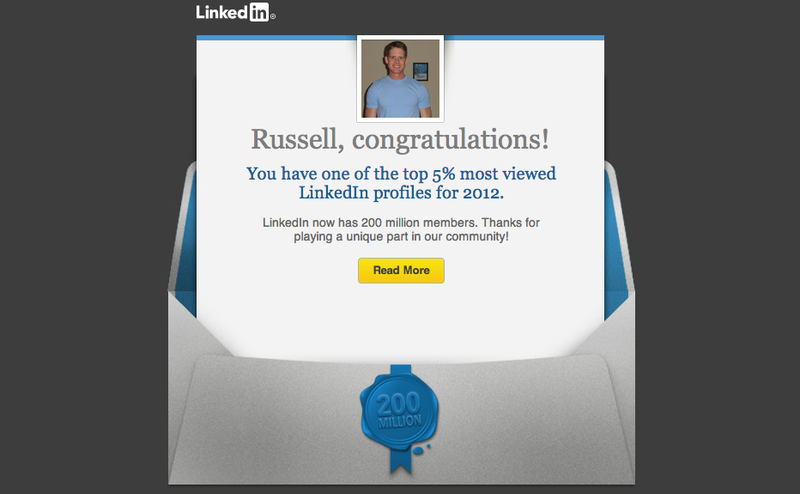 You Have One of The Top 5 Percent Most Viewed LinkedIn Profiles for 2012! LinkedIn has it figured out when it comes to ego bait. What’s the definition of ego bait? Ego bait is an incredible simple and often effective marketing tactic: Create a piece of content that lets other people or groups look good. Now I do have to be a sceptic about this “top 5 percent”. How many people actively use LinkedIn? Is it 15% of the 200 million users they have? If so then it would actually be pretty easy to get in the top 5 percent. Whether or not this is true, the campaign still seemed to work. This entry was posted in SEO by Russell Jensen. Bookmark the permalink.